People First: 1911 - the history that should have never happened but did! 1911 - the history that should have never happened but did! Why does Wales get a bad deal? Why is this country the poorest in the UK by far. The inference is that the Welsh deserve it. Even welsh born and raised politicians have rubbished the country's history and lack of talent. Wales need guidance and protection from the ambitions of its inhabitants. Those who live here don't deserve a fair share - if they had "real drive" they would surely have left and never come back ! Suppressing the "wrong" history is apparently a national pastime. Even recent events may be spun as something completely different. 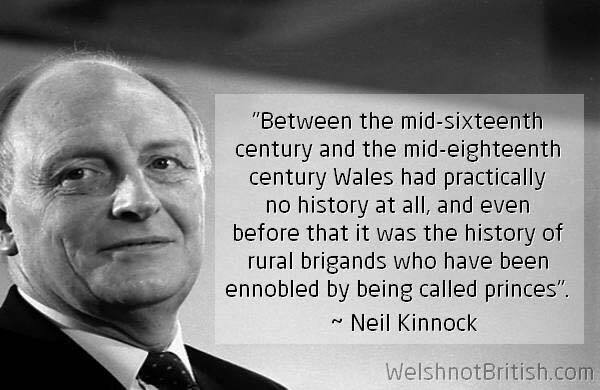 Neil Kinnock is an example of a man who did reasonably well in the UK sphere but was not renowned for his support of Wales, the project. His views on Welsh History were not far off the sentiments my children learned at school in history lessons. Their teachers do not have had much to work with, the Romans, the Tudors and the Second World war with welsh involvement as footnotes. Those of us old enough to have been supporting the miners in the Miners Strike of 1984-5 realised that it was primarily a successful attack by Margaret Thatcher on a troublesome are of the UK economy -a unionised heavy industry. In Wales it was a large part of the economy and surely deserved preservation. There was not the environmental concern of today about fossil fuels and the destruction of the industry was political. Welsh Labour supporters through those long months were waiting for the Labour leader to support the strike, especially in his own country. A touching sentiment, but forlorn. 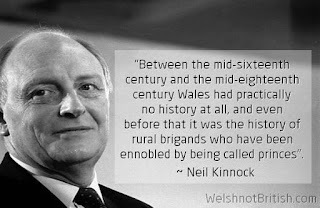 Interesting quote above where he airs his views on what he sees as a distinct lack of history in Wales. Remarkably a local Secondary School in Llanelli once did do a local history project on 1911 and I had not even heard of those events before my eldest child brought it home. Mysteriously none of my 3 younger children who attended the same school subsequently studied the 1911 events - they must have misplaced the project documents. You might think that history its something fixed in the past and interpretation may alter but not the facts. You would be wrong. The events of 1911, uniquely played out in Llanelli, and the massive attempts to suppress the facts and distort the truth, chillingly shadows the modern day distortions and cover ups of government blunders we currently see all over the world. Such is the ignorance about Llanelli 1911 that after the Centenary we decided to carry on with a few events every year to keep the memory alive of what really happened. I recently heard that a member of the public had gone to Llanelli Library to obtain some information on the subject of the 1911 Strike. He was told that they had no books or information. The gentleman at the desk dealing with the query remarked that "We wish it had never happened". I happened to have donated 30 books on the subject on behalf of the the 1911 committee to them 5 years ago! Where could they be? I suspect some of the hundreds of bilingual books we got printed with a Heritage Lottery Grant and sent to every Carmarthenshire school may also have disappeared. As someone who is no stranger to controversy I found the 1911 Centenary Commemoration strangely double edged. 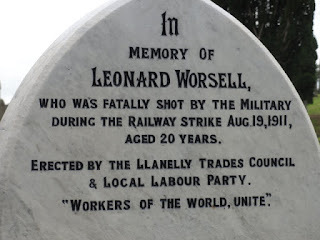 The first reaction against remembering 1911 I found ,was opposition on the grounds that the history was shameful and showed that the people of Llanelli were capable of rioting and looting. A less common but more deeply disturbing attitude is that a good welsh nationalist like myself should not be involved in working class history as it's an "English" subject. The first National Railway Strike was called in August 1911. Railwaymen were paid so little that they could not support their families despite 70 hour working weeks. The majority of other workers in Llanelli were significantly better off and there was a great deal of sympathy for the strikers. The UK government mobilised 57,000 troops to keep the railways and ports open. The railway was the major transporter of UK goods and the GWR line through Llanelli was transporting massive food imports coming in from Ireland . Huge pickets blocked the station crossing gates despite the efforts and bayonets of police and troops. Llanelli was the only place in Britain where the trains were completely halted. Liberal Home Secretary Winston Churchill sent in more troops. Railway still blocked. A local magistrate read the riot act and finally the troops shot onlookers, killing 2 of them. The crowds should have disbursed but instead ran at the troops who spent the rest of their trip to Llanelli barricaded in the station. Some of the townspeople took advantage of the situation to attack property owned by the local magistrates and the Railway companies. Ironically, by this point the strike had been settled. Grave in Llanelli's Box Cemetery of an English labourer shot in the back garden of his lodgings. Local Historian John Edwards.who wrote the book "Remembrance of a Riot" , the first comprehensive account of the events, says the emphasis on the looting, rather than the shooting, was the political reaction from the start and the incident is still locally known as the "Llanelli riots"as if it was some random criminal event. We still have an uphill struggle. August 17th Free Entry to all at the annual 1911 Historian's Forum at Llanelli Rural Council 5 for 5.30pm Speaker Robert Griffiths author of "Killing, no murder" book on 1911 events. 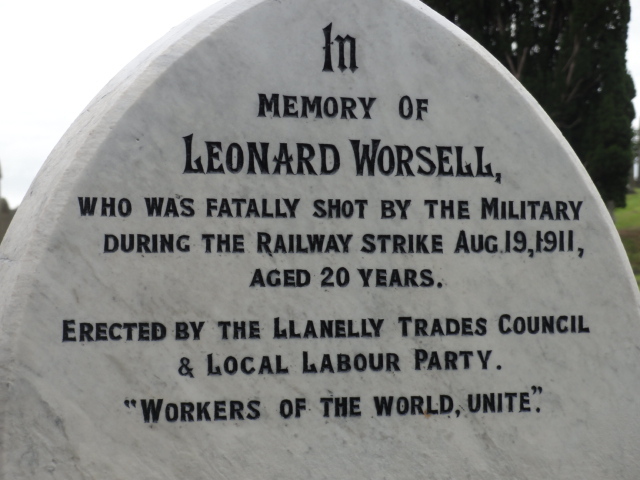 August 19th Commemorative March from Llanelli Station stopping at the site of the killings and on to the town centre.Gather 1.30pm for departure at 2.00pm. Speeches in Spring Gardens, Town Hall Square followed by wreath laying at Box Cemetery. There is a thousand years of Welsh history between the leaving of the Romans and the ascent of the Tudors to the English crown that has always been there to be found, in its erratically recorded forms, not as extensive as England's but _there_. Historians (Welsh and non-Welsh) and the educated (Welsh and non-Welsh also) have always known this. Do you really think the remarks of Neil Kinnock are worth quoting? Another discredited strawman not up to the power and responsibility his hollowed-out corrupt Party gave him. As my avatarname implies, I am Sais. So much debate in "Wales" (that English name) about its South, North and Middle but so little about the East and those who came to Wales from it over the millenniums. My regards to *People First* if you are for *Democracy*, *Accountability*, *Transparency* and (crucially) _active_ *Citizenship*.